As of today, over 400 Native American children have attended St. Joseph’s Rising Eagle Day Camp! It’s been a great week to spend with kids from the Crow Creek Sioux Indian Reservation. Monday was sunny and hot day, which was great for playing outside! We picked up some toys from Central Receiving, including toy trucks and cars for the sand box, walking stilts and pogo sticks. We also found an assortment of different balls and camp staff taught the kids to play 4-square and hopscotch. Day Camp is going great! Tuesday we had the Water Safety Course as our morning activity. The children really enjoyed riding around on the water and steering the small boats. Many thanks to our local Game, Fish & Parks office and the Army Corps of Engineers for their presentation. Wednesday, there were 47 children waiting for the camp bus, plus five dogs and some puppies. They even tried to get on the bus! Back at St. Joseph’s, we had one little girl who was upset and wouldn’t tell us what was wrong. Thanks to some TLC from Mary Jane, she was soon eating lunch and joined her group outside at the playground. Thanks Mary Jane! Each child received a toothbrush and toothpaste as they get off the bus to go home today. Thursday was another beautiful, hot day! We had lots of fun with our usual activities – playing outside games, swimming and crafts. Everything went great. 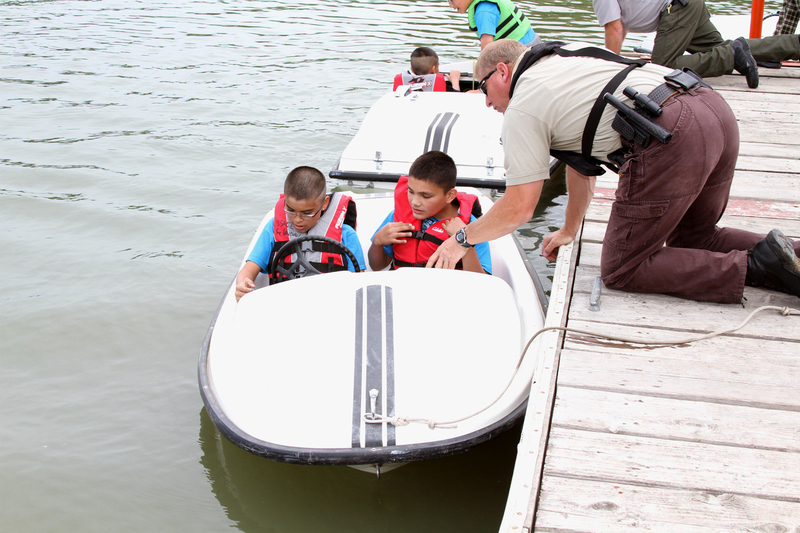 Next week, we’ll head to the Lower Brule Sioux Reservation to pick up day campers!